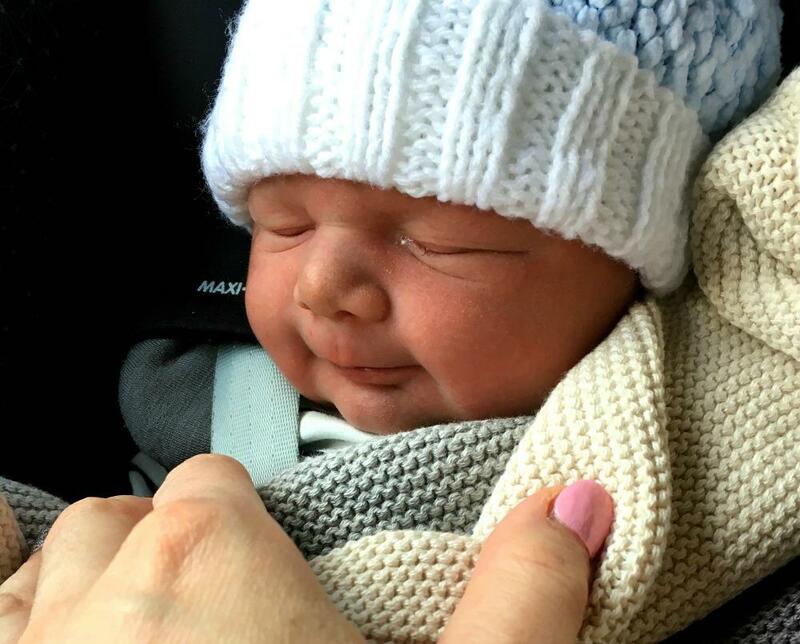 Our very anticipated and wanted little boy Arthur has made his appearance into the world. On the 7th of December 2017 at 6.16pm. He weighed 8lb 9oz. We named him Arthur William Taylor. He is the most amazing little man I have ever laid my eyes on. I am truly smitten and have spent the last three weeks soaking up as much of him as I can. His sweet gentle smell, the way he slowly moves his hands, and his sweet facial expressions. He is so quiet and sometimes you could easily forgot he is there. He is very content and sleeps a lot. He loves his milk and and he loves his cuddles. The first three weeks of his life have absolutely whizzed past I cant believe I sit here and write this and he is already three weeks old today. The transition from two to three children has been lovely for all of us. Sophia and Archie are a lot older so they have been brilliant. Its busy but its lovely and its been the perfect time because Daniel has been home for Christmas and its actually been the most relaxing few weeks for us. My mother in law came and helped us for three days cleaning and cooking which was so needed at the beginning and we were so very grateful for her help she made us all feel so relaxed. While we waited in hospital to be induced my mum had Sophia and Archie for us for the four days we spent in hospital. We weren’t given a specific time so it was a bit hit and miss as to how long I was to be kept in hospital. We missed Sophia and Archie very much, it was the longest we had ever been away from them too. But Sophia and Archie did come visit us in hospital on our last night and that was lovely and very needed. I cried when I saw them walking in the hospital doors. So far it has been a very easy transition from two to three children and so far I have found it very easy (dare I say) and manageable. I have had the three of them on my own for a few days already and its been absolutely fine. It is just about getting into a routine with the three of them. My third little baby and my second little boy I could not be more grateful to have had you. From the moment I knew you were in my tummy to the moment you were born and cradled in my arms you have given me the most amazingly positive experience. I really needed that, to be reminded that birth and pregnancy can be good. Each pregnancy and each birth so different and never the same. I have soaked up each moment of you, each stage, and season of our time together as much as I could. After I feed you I hold you close on my chest and I breathe you in. Your smell so subtle and so gentle. Everything about you is so gentle. I can already tell you are my sensitive boy. Very similar to your sister Sophia. You are such a lucky little boy, to be born into a family of people who love you to the ends of the earth. You brother Archie is so protective of you already and says he will share his bed with you and all his toys. He loves watching your face and all the different expressions you pull. He especially loves it when you stick your tongue out and he likes to copy you and stick his tongue out too. Archie cant wait to show you his motorbikes and his monster truck! Although at times he has been a little heavy handed when he first met you mostly now he is a pro at being gentle around you and understands how fragile you are. Archie is constantly telling me how cute you are and he loves holding you and looking at your little face, and then looking up at me and saying: “mummy he is so cute” he always says it. It just melts my heart. Your big sister Sophia has been so excited to meet you and hold you. She loves holding you so much and she is absolutely brilliant with you. She is your other mummy and my very special helper. She puts you to sleep for me as you lay on her chest dreaming, its your most favourite position and most favourite place to sleep. She has changed your nappies all on her own and she tells you how much she loves you everytime she lays her little eyes on you. Your daddy is smitten with you, just head over heals. He puts you to bed and actually you settle straight away with him. He loves you so much little one and you really are the luckiest little boy. As for me, your mummy, I am completely in love with every little inch of you. 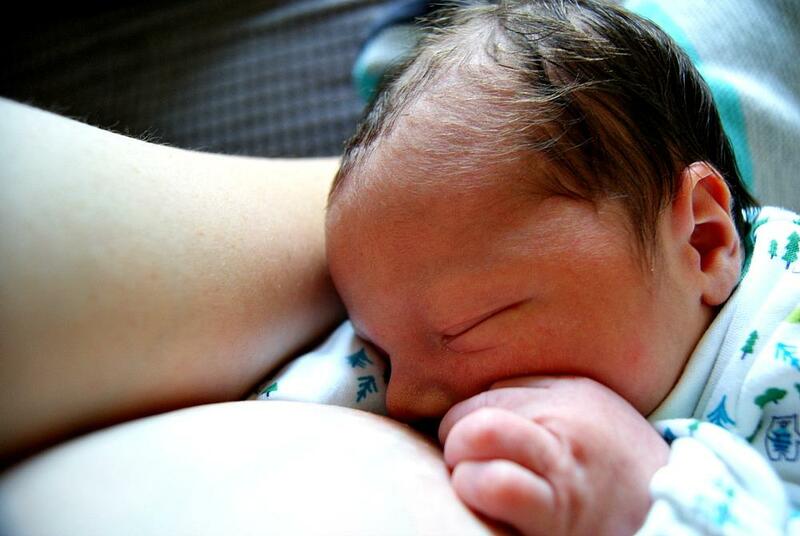 I love holding your hand when you breastfeed and when you squeeze my finger so tight, your little face nuzzles in and you your eyes gently close. I feel so lucky to have given you life and had the privilege to watch you grow these last three weeks. Your tiny little body so small it still shocks me. I cant believe how little you really are. I absolutely adore all your little sounds, and you are quite the growler. You don’t really cry at all and are a very happy content calm and quiet little boy. The first three weeks have been an absolute dream with you. It is genuinely so lovely to watch Sophia and Archie bond with you and they have a few disagreements on who holds you first, they both love you so much. I am very lucky to have two such loving children who adore their new brother. I am still very much in my newborn bubble and feel so grateful. We are all so happy to have you here safe with us. All of us, your family cannot wait to watch you grow and your personality develop. We can’t wait to get to know you little Arthur and I know you, Sophia and Archie will be the best of friends, the three cheeky musketeers. Mummy and Daddy feel like the proudest parents to have all three of you. We really really do. 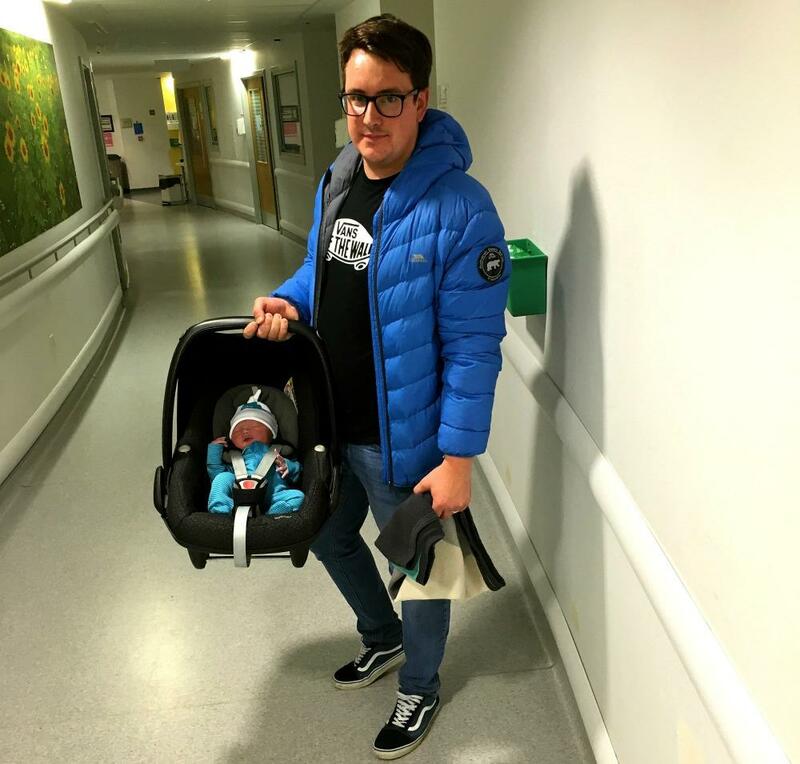 Daddy proudly carrying you out of hospital. You are three hours old in this photo. Big congratulations. Beautiful post and he’s adorable. 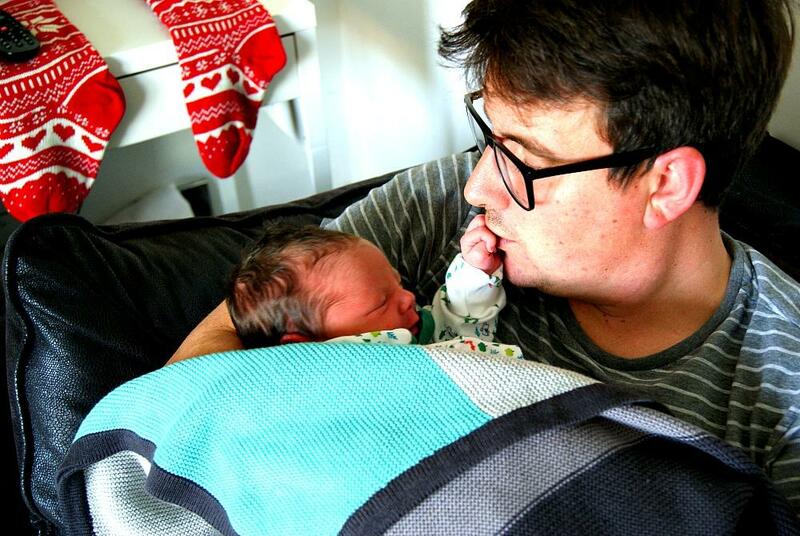 Can I also say to write a blog post 3 weeks after giving birth is amazing.